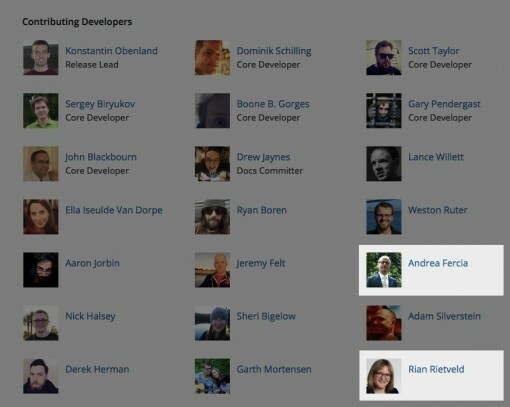 Andrea Fercia makes his second appearance and Rian Rietveld her first on the WordPress 4.3 credits screen. Andrea Fercia (@afercia) has made serious waves during the WordPress 4.2 and 4.3 cycles as an accessibility team liaison to the core team. In his time contributing to WordPress, he’s injected a considerable amount of valuable feedback and experience – in addition to development chops – to helping make WordPress accessible all-around. I’m excited to see how WordPress will change for the better with Andrea leading the charge. Rian Rietveld (@rianrietveld) more recently has taken a leadership role in helping to wrangle an accessibility testing team that has already pointed out some pretty big problems with both new and existing core features. We only benefit from having more people examining these experiences, and the accessibility testing team is worth their weight in gold on that front. Of course, we can’t forget the contributions of accessibility team member Joe Dolson (@joedolson) either, seeing as he was featured as a recent rockstar in WordPress 4.0, 4.1, and 4.2. Joe has been a valued contributor for a long time and I look forward to seeing what he’s working on next. If you’re interested in getting involved with the accessibility team, check out the accessibility site on the WordPress.org “Make” network, or drop into the #accessibility channel on Slack and say hello. They meet weekly on Mondays at 18:00 UTC.